Green Data Center Market size is set to exceed USD 25 billion by 2024; according to a new research report by Global Market Insights, Inc. 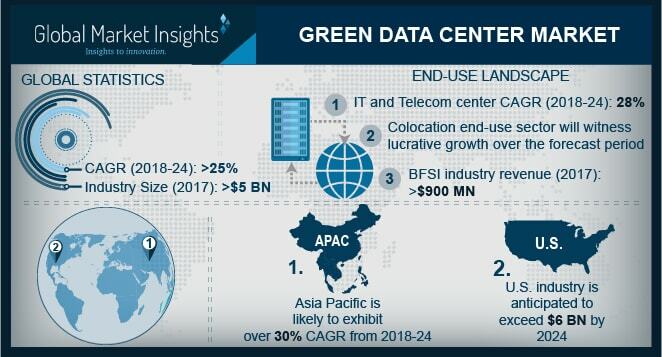 The green data center market in Asia Pacific will experience a strong growth of over 30% from 2018 to 2024 owing to the widespread adoption of cloud and IoT technologies in countries such as China and India. The rapid growth in the number of startups in India coupled with the favorable government initiatives such as Make in India will support the green data center market growth in the country. The booming industrial sector in Japan is demanding high performance equipment for mounting volumes of data from connected factories. The rise in the number of smartphone users in China are also demanding data center set ups for data storage. Infocomm Media Development Authority (IMDA) has collaborated with government agencies to develop a Singapore Standard for green infrastructure under the IT standards committee. Players operating in the green data center market comprise Dell Inc., Huawei Technologies Co., Ltd., HCL Technologies Limited, IBM Corporation, Microsoft Corporation, Fujitsu Ltd., Schneider Electric SE, and Hewlett-Packard Enterprise Company. Companies are striving to launch new data centers to strengthen their market presence. In May 2016, Microsoft stated that they will be obtaining a LEED Gold certification for all its structures to lower their PUE. Vendors are also increasingly incorporating latest advanced technologies in their data centers to reduce the hazardous emissions and power consumption. Increasing competition among companies to offer advanced solutions will propel the green data center market growth.